This green smoothie recipe is PACKED with protein and nutrients, but it tastes like a mint chocolate chip milkshake! 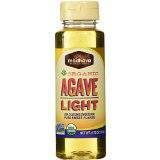 It’s quick, easy and SO healthy! 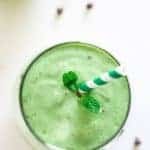 Oh green smoothie recipe packed with healthy greenery and creamy, vanilla, protein-goodness, where have you been all of the 24 years of my life? You guys. I thought that I was living in Washington until I up and made this smoothie. Up until my taste buds met the (really cute and stripey!!) straw, they were completely and TOTALLY anti green smoothies. I mean, a kale salad recipe? GIMME DAT. But, kale all blender-ized up and sipped through a straw. Umm. No thanks. I like to chew my vegetal friends please. 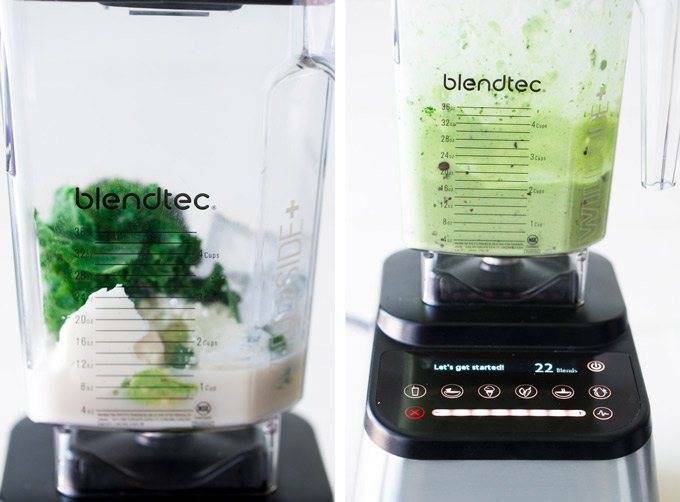 BUT, when I had the opportunity to make a little recipe magic with my new Blendtec Designer 725, I knew that I wanted to see how it would fare in the land of smoothie making. Remember when Mr.FFF made his recipe debut with the pear smoothie and I told you that I am just not a smoothie sipper? I mean, unless it’s a chocolate avocado smoothie from Texanerin, that is. WELL. The reason is because everysingletime I have ever made ANY SMOOTHIE.…it basically just turns out as icey water. It doesn’t matter if it’s a pineapple smoothie, an avocado smoothie bowl or a banana vanilla orange smoothie. THEY’RE ALL ICY. No thank you, the sequel. So, I wanted to see if the Blendtec would finally give me that thick, SUPA creamy texture that I was craving. Literally. I crack myself up. Well, my peepsie-doodles, when I turned it on and the power BLEW MY UTENSILS off the counter (LIKE WHOA) I knew I was in for a treat. There was definitely no sign of the icey-icky-watery smoothies of days past. The Blendtec made this green smoothie recipe soooo CR to the EAMY. Now, I can’t lie to you. I wasn’t even planning on adding kale because I was still a little bit 0_o about the whole leafy greens in my beverages shenanigans. BUT, what is a mint chocolate chip smoothie if it isn’t GREEN? ONE BIG LIE. That’s what. Apparently I have lies on the brain today. Let’s not start getting all deep and inquisitive and wondering why that may be capeesh? I had some leftover K-izzle (the super trendy name for kale. That I just invented) in the fridge so I decided to just DO IT. AANNND in it went. I pressed the power button. BUZZ SHRED BUZZ went the kale. “SUCCESS” went the Taylor. BUT, how would it taste? Oh, ya know, like a MINT CHOCOLATE CHIP MILKSHAKE. PPPP.SSSS….I have another Christmas drink for you using the Blendtec TOMORROWZ. There’s yummy, spicy molasses goodness. FORSHADOWING. This green smoothie recipe is PACKED with protein and nutrients, but it tastes like a mint chocolate chip milkshake! It's quick, easy and SO healthy! Place all ingredients up the chocolate chips in the Blendtec and press the "smoothie function." 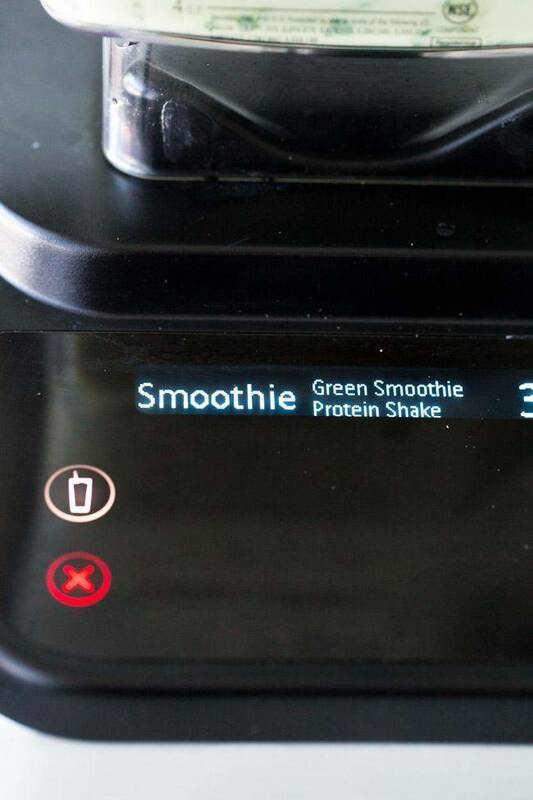 Once there is only 15 seconds remaining until your smoothie is ready, stop the Blendtec and add in the chocolate chips. Blend on the "smoothie" setting for an additional 15 seconds and DEVOUR. I used my Blendtec Designer 725 to create this recipe. You are totally selling me on this green smoothie, Taylor! I’ve always been a little hesitant to try them, but this one sounds incredible! I love the mint and chocolate flavors in here. Such a great treat! Pinned and making soon! Hey, I feel ya! I was hesitant too, but this seriously changed my LIFE! Thanks so much for the love and pin Gayle – I hope it changes your mind on green smoothies too! This looks so good Taylor! I love that it is so healthy because I have a little brother that is obsessed with smoothies and that’s basically the only way to make him eat nutrition. He’s going to love this! Oh brothers, so bad at being nutritious! I hope he loves it – thanks Tori! Mmmm this sounds soooo tasty! I love me some mint chocolate and green smoothies. And I feel like I need something nutritious yet dessert like right now! Pinned! TOTALLY! Need to balance the cookies! Thanks Meg! This might be the only way you can get me to drink something green…. mint (even with greens). Great idea! Mint for life right? Thanks girl! 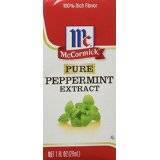 I’ve been hesitant about kale in my smoothies too but masking it with peppermint sounds brilliant! It totally masks it! Thanks Sharon! I’d love to be in your brain during your writing process. You are a hoot, girl! Someday we’re gonna meet somewhere, have a few cocktails, and sit down to a writing party! I feel like that would result in some of the best reading ever! It’s crazy how you can’t taste them right? Love it! Thanks girl! These remind me of shamrock shakes only Christmas-y 🙂 I’ve never tried kale in a smoothie….probably because I know my blender would fail. Kale by itself, yes and spinach in a smoothie, YES. That’s sad about the blender fail, because smoothies with kale are so yum! Thanks girl! WOOO, yay for smoothies with avocado…it makes it so creamy! I was so worried about the kale, but it’s a small amount so I couldn’t taste it 😉 Thanks girl! It’s so wonderful to see a healthy smoothie recipe during a season full of indulgent goodies! This smoothie has such a wonderful combination of healthy ingredients (I’m a big fan of kale) and it looks incredibly tasty. What a nutritious way to start the day! Thanks Sarah! Gotta balance out the cookies! You crack me up! 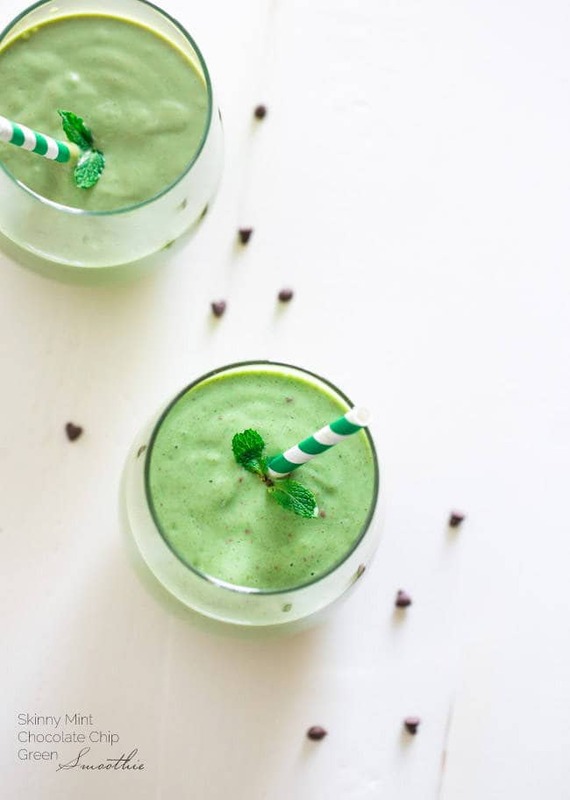 Mint chocolate chip is my favorite milkshake combo so I have no doubt I’d be all over this healthy version! It’s mine too! You would totally love it then 😉 Thanks friend! Oh how I love mint chocolate chip. YUMMY!!! You and me both Charlotte! Hi Taylor. 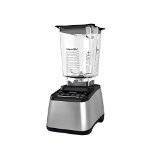 We LOVE smoothies here, and more than that, we love high powered blenders. I have a Vitamix and have had a BlendTec, too. Smoothies in a regular blender=chunky, uninspired. Smoothies in a high powered blender= AMAZING, SMOOTH, creamy goodness. The first year we had a Vitamix (2012), I made a different smoothie every week. My favorite is Key Lime Pie. I’ve made chocolate chip mint banana “ice cream” in the BlendTec, but as a smoothie it sounds amazing! I will make one tonight as our “salad” :). Thanks for sharing! RIGHT?! I never thought that it would make THAT much difference but it totally does! I love that you have a smoothie as a salad! I need to do that – thanks Sonja! You crack me up. I love the mint-chic combo! And I am so excited to play with my Blendec!! Kale in a shake sounds so freakin’ delicious. Seriously girl….Im a smoothie addict and this one is being filed under “need in my face now”. So perfect esp. around the holidays when I need something fast and healthy. Very cool. You haven’t tried kale in a smoothie!? I seriously thought I was the only one! GIRL, you need to try it! Please let me know if you do! Thanks Chrysta! Haha, for a second I thought it might be this new epic protein powder you found but no…you once again, amazed me. Avocado AND kale? Okay you’ve got me tempted. PS Have you tried Dymatize Elite Casein or Optimum Nutrition Casein- They both are epic when used in baking/food unlike other powders, and have really good flavours! Thanks Arman! 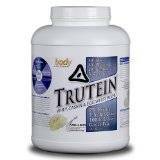 P.s you should try the Trutein Mint chocolate though! And try that link I just showed you. Also epic with peanut butter! Made this for a morning snack with the addition of a frozen banana and a handful of fresh mint that was languishing on my counter and it was delicious and filling too! Woo hoo! So glad you liked it girl – thanks! Earlier I was afraid of having this due to the outrich content called the chocolate.Now feeling relaxed as saw in the web that chocolate is good for our Health. Anyways keep do share us with more related content in this website. Wow… this looks amazing and my kids would love it. 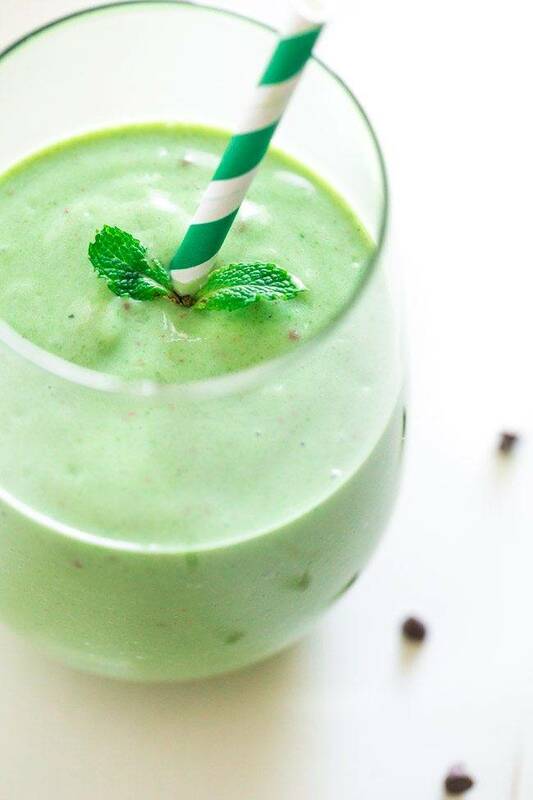 I’ll definitely try this mint chocolate green smoothie recipe and share my opinion about it. I’m also gonna pin this post on my Pinterest board my followers will love it. Thx for sharing! Wow. 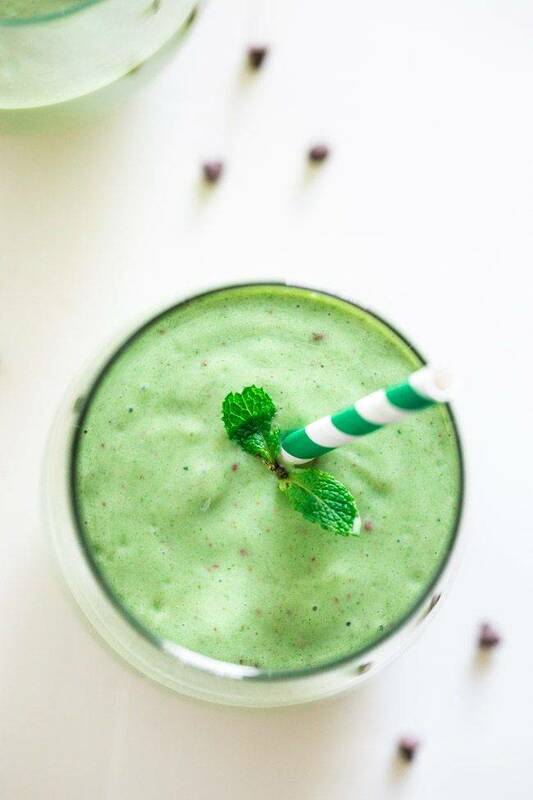 This mint chocolate green smoothie look is the pure combination of taste, I love healthy smoothies.